Last week we looked at a tale about a moose. This week, we’re going to look at a tale told by a moose. 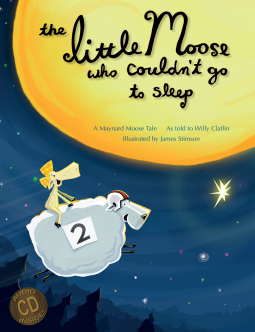 The Little Moose Who Couldn’t Go to Sleep was told by the great moose storyteller, Maynard Moose, to Willy Claflin who wrote it all down and had it illustrated by James Stimson. Yes, it’s not my traditional Thursday post, but it’s a fun book and it is posing as a traditional Moose story. The story is about Little Moose who can’t get a good night’s sleep. Her mind just keeps working all night long, thinking about just random things, like I can picture a kid thinking about. She’s a cutie, but the next day at school, she’s so tired that can’t pay attention and isn’t learning well. Her parents try to help, but the moose recipe for sleeping well is to eat a big bowl of legumes and go to bed an hour early, neither of which little moose is happy about. Her mother also tells her to try counting sheep, but hen, as she’s counting sheep the second sheep talks to her. She tells the sheep her problem and he takes her to the kitchen of Mother Moose, who makes everything in the universe in her big, cozy kitchen. Mother Moose herself is not home, but the sheep brews up some tea and takes Little Moose with her tea back to her own bed. There she slowly sips the warm tea and drifts off to sleep all warm and cozy. The next day she does wonderfully at school, thanks to the good night of sleep. From then on she has less trouble sleeping and on nights when she does, the sheep takes her for a cup of tea in Mother Moose’s kitchen. The story does impress on kids the importance of a good night’s sleep to be at your best the next day, but I like it because it’s just so funny. The summary doesn’t really do it justice. The book is full of moose-speak but thanks to a glossary in the beginning, we know that skimmering means gliding and skipping over anything shimmering and driftee means to slowly drift, mostly sideways, sometimes upside down. It would be a fun book to read aloud. It’s full of made-up words and the grammar’s not quite right a lot of the time, because it is moose after all. I will say, though, if you’re against reading books with bad grammar to your kids, don’t pick this one up. I personally am not. I think that even kids can recognize that this is not how people write or speak – these are moose. I can picture reading it with a slow moosey voice for the narration parts and a lighter fun, girly moose voice for Little Moose. I had a copy of the e-book, but I guess the hardback comes with a CD. On the one hand I’d like to hear the CD version, on the other hand I think this is one of the books where half the joy is reading it aloud. “OK!” Say Little Moose. Her go to bed that night, tuckee the self in, under the little bankee with the duckies and the zebras. “I like my little bankee with the duckie and the zebra!” say Little Moose. “Duckies and Zebras on my bankee—dum-de-dum de-dum…. Huh! I wonder why they have picked duckee and zebra to put on my bankee? I mean, you could have a elephump and flamingo bankee. That would make a nice bankee—elephump and flamingo bankee…you could have any amunal you would like. You could have…you could have banana and tarantula! ‘Cause I have heard that tarantula like bananas. I wonder if a banana could like a tarantula? 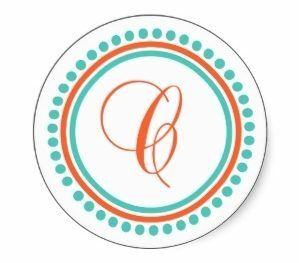 Do you think you would have to be a amunal to like something? Or could a fruit or a vegetable like something? I wonder that. It’s a good bedtime read. Makes me want to go the Mother Moose’s kitchen for tea and gingerbread. The cartoony illustrations add to the story. They’re bright and colorful during the day and full of blacks and purples and grey at night. Mother Moose’s kitchen is warm with yellows and oranges. The animals are all decked out with bow ties and glasses – it’s just cute. If you love Maynard Moose tales from the Northern Piney Woods, then be forewarned, this book might just be the funniest yet. The fourth installment in the Maynard Moose series, provides the back story for the Maynard Moose tales. In this whimsical telling of how Little Moose struggled with going to sleep each night, you’ll meet Little Moose, Maynard’s youngest cousin and his favorite kin, her parents Mr. and Mrs. Moose, the sheep and most important you’ll learn the legend of Mother Moose and her kitchen. You’ll also visit Moose Academy where young moose go to learn proper posture, Woodland Skills and counting to three over and over again. This whimsically illustrated story also includes a CD along with a Moose to English dictionary.